The microphone-data.com web site: a really useful free resource for comparing mic models from different manufacturers. Your article about matching mic and preamp impedances in the May 2014 edition of Sound On Sound lists the standard output impedance for mics from Europe as 150Ω, but 200Ω for those from the USA. However, Bill Whitlock suggests the exact opposite situation in his very in-depth chapter on audio transformers in the Handbook For Sound Engineers (now in its fifth edition, edited by Glen M Ballou, Focal Press, ISBN 978-0415842938). As I had made a mental note of this convention after reading your article (I’m learning all I can) and saw this discrepancy, I started digging deeper and have seen further documentation on Neumann’s web site suggesting 150Ω is common in the USA and 200Ω in Europe (I also found an article about how mics were modded by Gotham to 150Ω for the US market). So, thought I’d let you know, and see if you had any further comments! I inherited the supposed international allocation of mic output impedances I gave (150Ω in Europe and 200Ω in America) from my BBC training days long, long ago — and at that time it did seem appropriate, based on the nationalities and ratings of the mics in common use within the BBC. Like you, I have also seen the reverse allocation mentioned in print occasionally, but I hadn’t bothered to explore the details further until now. Having now investigated the subject further, it appears that manufacturers on both sides of the Atlantic employ these two nominal output impedance ratings across their microphone ranges seemingly at random. 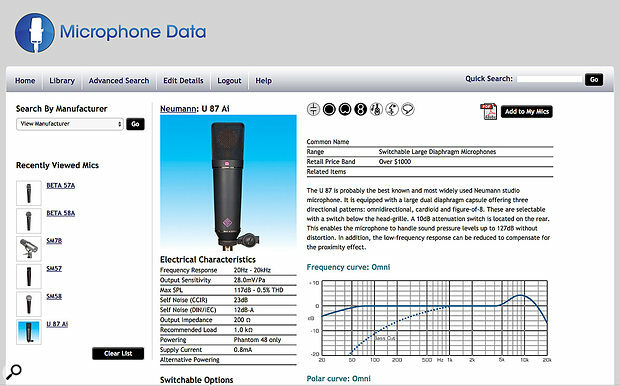 For example, a search on the Microphone Data web site (www.microphone-data.com) of Neumann’s mics — unquestionably the best-known European mic manufacturer — lists nine models with a 200Ω output impedance, and 13 with 150Ω. Similarly, a search of Shure’s microphones — the archetypal US mic manufacturer — lists 30 with a 200Ω impedance and 55 with a 150Ω impedance. So I think from this brief database trawl we can draw two conclusions. Firstly, the 150Ω rating is more popular — and this makes sense, since it allows a lower Equivalent Input Noise figure for the preamp. Secondly, there really is no international preference for output impedances! There probably never really was, and in reality the nominal output impedance of any microphone could be given as either 150Ω or 200Ω as the manufacturer sees fit. From a practical perspective, it really doesn’t matter what value is ascribed to the nominal impedance as long as it is below 200Ω, since the microphone/preamp interface employs voltage-matching. As long as the preamp’s input impedance is at least five times the microphone’s output impedance it will all work just fine — and most preamps actually offer an input impedance of around 10 times higher than most mic output impedances anyway (ie. typically 1.5-2.5 kΩ). In light of your comments, though, I’ve amended the article you cited to remove the possibility of further unhelpful confusion from the promulgation of dubious international ‘standards’. Thanks for drawing our attention to it.